Whether or not you choose to celebrate the last day of October as Halloween and how you do so falls into the category of liberty of conscience, in my opinion. However, I think it’s unfortunate that so many Christians get caught up in and distracted by Halloween festivities, yet they ignore (or are ignorant of) the fact that October 31st is an important day historically in the church. 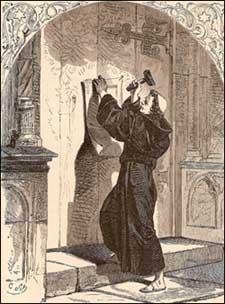 Next year will mark the 500th anniversary of the day in 1517 that Martin Luther challenged the erroneous, unbiblical teachings and practices of the church when he nailed his 95 Theses to a church door in Wittenberg. It wouldn’t be until the following year that Luther really came to understand the important doctrine of justification by grace alone, through faith alone, as stated in Romans 1:17, “For in [the Gospel] the righteousness of God is revealed from faith to faith; as it is written, ‘The just shall live by faith. '” He came to see that sinners are justified by God based solely on the work and righteousness of Jesus Christ, and that we contribute none of our own righteousness to our salvation. The themes and focus of Luther’s preaching and writing from that point can be summed up in what came to be known as the Five Solas of the Reformation: Sola Gratia, Sola Fide, Solus Christus, Sola Scriptura, and Soli Deo Gloria; that is: By Grace alone, Through Faith alone, In Christ alone, According to Scripture alone, For God’s Glory alone! Many good articles have been written about what Martin Luther did and the results that we still see and enjoy today, including this brief overview which was published a couple of years ago on the Ligonier Ministries blog. On Friday, much of the culture will be focused on candy and things that go bump in the night. Protestants, however, have something far more significant to celebrate on October 31. Friday is Reformation day, which commemorates what was perhaps the greatest move of God’s Spirit since the days of the Apostles. But what is the significance of Reformation Day, and how should we consider the events it commemorates? An heir of Bishop Augustine of Hippo, Martin Luther is one of the most significant figures God has raised up since that time. This law student turned Augustinian monk became the center of a great controversy after his theses were copied and distributed throughout Europe. Initially protesting the pope’s attempt to sell salvation, Luther’s study of Scripture soon led him to oppose the church of Rome on issues including the primacy of the Bible over church tradition and the means by which we are found righteous in the sight of God. This last issue is probably Luther’s most significant contribution to Christian theology. Though preached clearly in the New Testament and found in the writings of many of the church fathers, the medieval bishops and priests had largely forgotten the truth that our own good works can by no means merit God’s favor. Salvation is by grace alone through faith alone, and good works result from our faith, they are not added to it as the grounds for our right standing in the Lord’s eyes (Eph. 2:8-10). Justification, God’s declaration that we are not guilty, forgiven of sin, and righteous in His sight comes because through our faith alone the Father imputes, or reckons to our account, the perfect righteousness of Christ (2 Cor. 5:21). Martin Luther’s rediscovery of this truth led to a whole host of other church and societal reforms and much of what we take for granted in the West would have likely been impossible had he never graced the scene. Luther’s translation of the Bible into German put the Word of God in the hands of the people, and today Scripture is available in the vernacular language of many countries, enabling lay people to study it with profit. He reformed the Latin mass by putting the liturgy in the common tongue so that non-scholars could hear and understand the preached word of God and worship the Lord with clarity. Luther lifted the unbiblical ban on marriage for the clergy and by his own teaching and example radically transformed the institution itself. He recaptured the biblical view of the priesthood of all believers, showing all people that their work had purpose and dignity because in it they can serve their Creator. 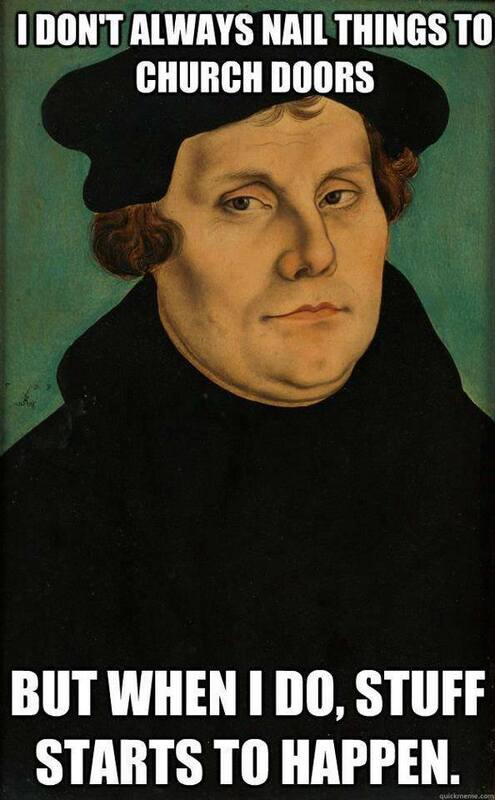 Today, Luther’s legacy lives on in the creeds and confessions of Protestant bodies worldwide. As we consider his importance this Reformation Day, let us equip ourselves to be knowledgeable proclaimers and defenders of biblical truth. May we be eager to preach the Gospel of God to the world and thereby spark a new reformation of church and culture. This entry was posted in History & Biography, Random Musings and tagged 95 Theses, Halloween, Martin Luther, Reformation day. Bookmark the permalink. 1 Response to Happy Reformation Day!